the shapes of various gemstones. This star ruby and diamond ring is the embodiment of the words “grace,” “fineness,” and “ splendor.” The star ruby is held securely in place by long prongs that resemble the claws of an eagle. The beauty of the sequence of diamonds arranged around the star ruby and the elegance of the open space between the gemstones combine to create a heightened sense of gracefulness. To emphasize the beauty of gemstones, it is best if the precious metals are not too noticeable, but the fine lines of gold bordering the outer rows of diamonds serve as a focal point that tightens the whole impression of this ring. Close inspection of these lines of gold shows that they are separate from the diamonds. The center stone is a cabochon-cut ruby that displays a six-rayed star when light is shined on it. This star effect is called “asterism.” It is caused by “silk” inclusions, which are fine, needle-like crystal inclusions of the mineral rutile that occur in three directions at 60-degree angles within the stone. Light reflecting off the rutile males the star appear on the surface of the cabochon. The attractive combination of its fine red color, distinct star, and pleasing outline qualify this star ruby as gem quality. Though the surrounding diamonds are small, the well-shaped marquises and strongly brilliant rounds are arranged in a well-balanced fashion, adding to the ring’s magnificence. The ring shown below has a round brilliant cut diamond as its main stone, but the style is actually the same as the star ruby ring to the right. Since the center brilliant-cut stone is round instead of an oval like the star ruby cabochon, and the size is six millimeters instead of ten, the ring’s shape has been changed. The V-shaped borders are now in a straight, parallel arrangement, and the design has been adjusted to accommodate the more limited space. This design is an ideal style for remodeling, and has reportedly been requested by many customers over the past twenty years. There are many options available depending on the character of the center stone such as using tapered baguettes as accent stones instead of pear shapes. 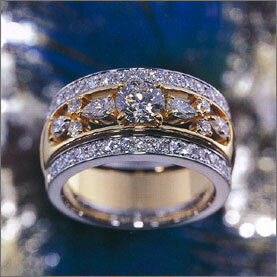 This is a superior design concept for customers who desire a more personalized piece of jewelry.